When it comes to styling your stationery kit, our Pink Recycled Plastic Ruler is the ideal option. From lovers of colour through to those who simply want to achieve the perfect line, it offers durability and an easy-to-use design. The entire ruler has been crafted from recycled fabric; taking into account the drive towards eco-friendly purchases. This hardwearing material also affords it enough flex to reduce the risk of snapping or shattering when put under pressure. Each of the four corners has been slightly rounded off - a design choice opted to reduce the risk of injury when used by younger individuals. It has a bright neon pink colour with contrasting black line indicators at each inch and centimetre line. When used for tasks such as mathematical projects or sketching sessions, it helps you to produce a perfectly straight line every single time. So, regardless of whether you favour trigonometry or simply want to add straight lines to your work, this ruler is the choice for you. Here at The Ruler Company, we understand the need for bulk purchase when it comes to rulers for your organisation. That's why we offer these rulers at the lowest possible wholesale price while maintaining the high-quality design. In turn, if you need to replenish a larger number of rulers for your business, we can offer a discounted price of £0.24 for orders over 10 and 0.18 for orders over 100. 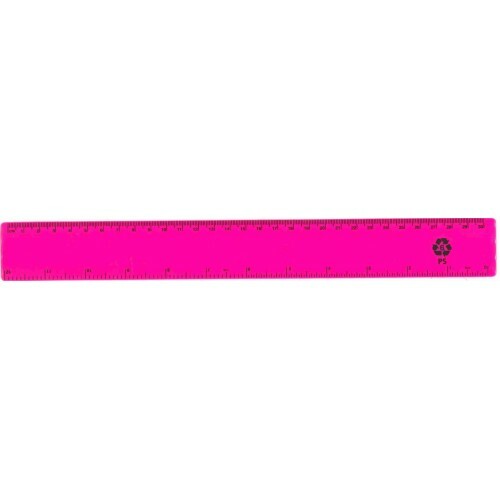 Schools, offices and study sessions alike will appreciate the quality of these bright pink rulers.